Anne's Food: Happy 5th birthday! It's that time of year again - blogaversary! My blog turns five years old today - I can't believe how time flies! I used home made cherry apricot jam, which obviously made things a lot tastier but also less instant - but use whatever you happen to have! Beat the eggs and sugar until very fluffy. Fold in the baking powder, flour and water, and the seeds of the vanilla bean. Spread in a lined rimmed baking sheets, and bake at 250°C for five minutes. Remove from the oven. Sprinkle with sugar, and immediately turn the cake up side down onto a second baking sheet, lined with paper. Peel off the first paper, and place the rimmed baking sheet on top to preserve the cake's moistness while it cools. 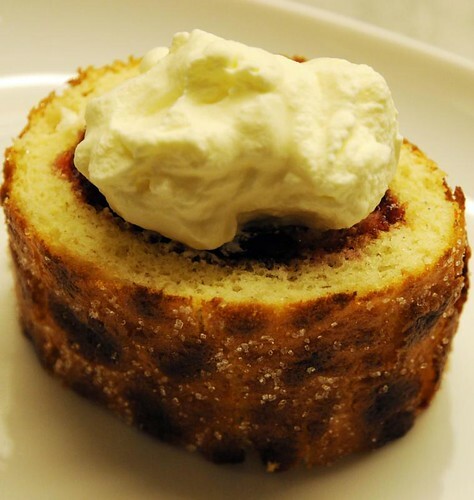 When cool, spread with your favorite jam, and roll up tightly. Wrap in plastic and store in the fridge until you need it. Last year - a Swedish version of the Black Forest Gateau. happy anniversary! this is quite an achievement! Five years WOW. Something we can all apsire to. Happy blogoversary Anne. I am a long-time lurker here and I love your blog. Happy blogaversary, Anne! My 5-year mark is Saturday--I had no idea we started so close together. And now look at us, all mom-like. BTW have you had a chance to watch "Julie and Julia" yet? It's a great 'blog' movie. I loved it. Happy anniversary! Your blog is the first one I started reading. I did not have an idea what blogs were about until I somehow ended up on yours. So this is very special. I have enjoyed your blog very much. Five years is quite an achievement. Congratulations.